Psalm 104 provides a break from the early psalms (Psalms 1-6) and from the Psalms of Ascents (Psalms 120-122). This psalm presents the poetic description of Creation as compared to the narrative of Genesis 1:1-2:3. An anonymous psalmist marked off this psalm’s 35 verses by means of an inclusio like that used in Psalm 103. As a psalm of praise, it exhibits hymnic participles. As Hebrew poetry the psalm displays many forms of imagery that enhance its beauty. Psalm 104 offers an interpretive challenge regarding its subject matter: does it refer only to Creation, or also to the Flood of Noah’s day? At what point in the psalm does the author move from Creation to either the Flood or to the natural processes observable at the present day? We begin with the first four verses. 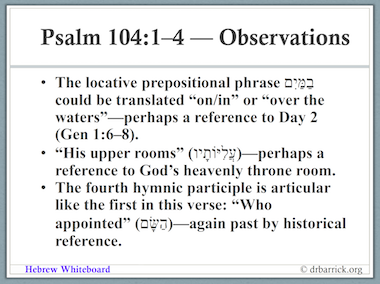 Click on Hebrew Whiteboard to download Psalm 104:1-4 or any of the previous studies of Psalms 1-6 and 120-122.